Spring the foundation of hope, for the Endless summer! It’s sunny but there is a nip in the air, get outside free your self from winter’s damp shackle. Stand by the BB Q and warm yer love ones, cook a meal and enjoy a Spring day togeter. 2. Peel red onion, trim ends and cut 1cm rounds. Core tomatoes and cut in half from top. Place onions and tomatoes in bowl, lightly oil and season. 3. Season 2 5oz Halibut Filets with salt, pepper and lemon juice. 4. Place tomatoes and onions on grill, cook 3-4 min per side. When done place in saute pan, and place on low side of grill half. Add pernod and reduce 1/4 of the liquid. Add Butter dill, kelp,and capers stir well set aside. 5. Lightly oil grill grate. 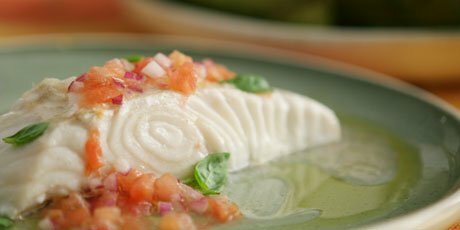 Place Halibut on Grill, and cook 4-5 minutes per side. 6. Platter Halibut and pour tomato pernod sauce over top! Easily adaptable to most campfires!